Bell is currently kill listed----for being scared at the ACC she is rated New Hope--- needs a rescue/adopter to pull her to safety. BELL DESPERATELY NEEDS A NEW HOME & NOW. 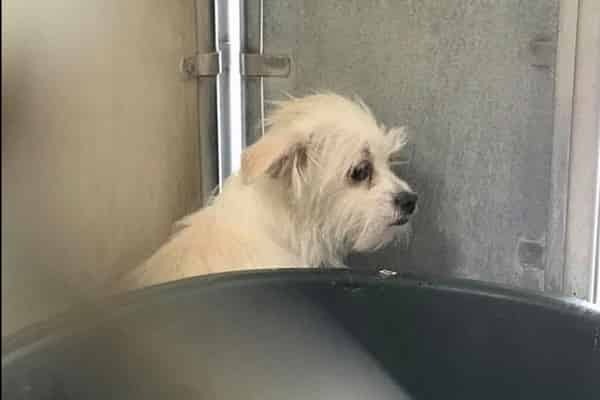 DOGS DO NOT BELONG ON DEATH ROW & this little one could die anytime. HELP! BABY BELL in grave danger 😢 URGENT! Time is crucial for the dogs on the euthanasia list! they get only hours.....so little time. My name is Bell and I'm an approximately 2 year old female terrier. I am not yet spayed. I have been at the Lancaster Animal Care Center since September 29, 2017. I am available on September 29, 2017. You can visit me at my temporary home at L314. The staff/volunteers here at the animal care center have found that I spend most of my time indoors. I do not show interest in small children. I have begun housetraining, but I still need some work. I have not learned how to walk on a leash. I am just learning obedience skills. I seem to get along well with dogs. 5 Responses to "Very young pup frozen in fear, she so badly hurt that nobody came to adopt her"
Hi friends, Bell is safe and sound. She was picked up yesterday after her spay and at boarding until Oct 13 for her transport up to my rescue, Family Tails Dog Rescue in Washington. I will do a group pm for the pledgers and my info. Thank you so much! Hi, Bell has been rescued and is safe in boarding and will be coming to Washington Oct. 14th. She is very sweet and loves to be held and she is a tiny one. She will be up for adoption after we get to know her and give more info on her. I would have taken her without her being transport to Washington. i am so upset.Have my own vet and cures. She would have had a friend to play with. Just saw fb post and had to fight tears back so I could read the comments. When I saw she was safe I could immediately start to breath normally! Thank you so much Family Tails Dog Rescue for helping this little girl.